For special artwork, only a bronze frame will do. The classic, deep richness of the bronze art frame brings out the mood of certain paintings. Our bronze frames come in a variety of sizes and styles, ranging from very plain to ornate and unique. Can't find the size you're looking for? We also offer custom sizing from hard-to-fit artwork. 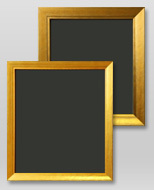 Browse Art Gallery Frames' bronze picture frames below to find one that’s perfect for your needs.